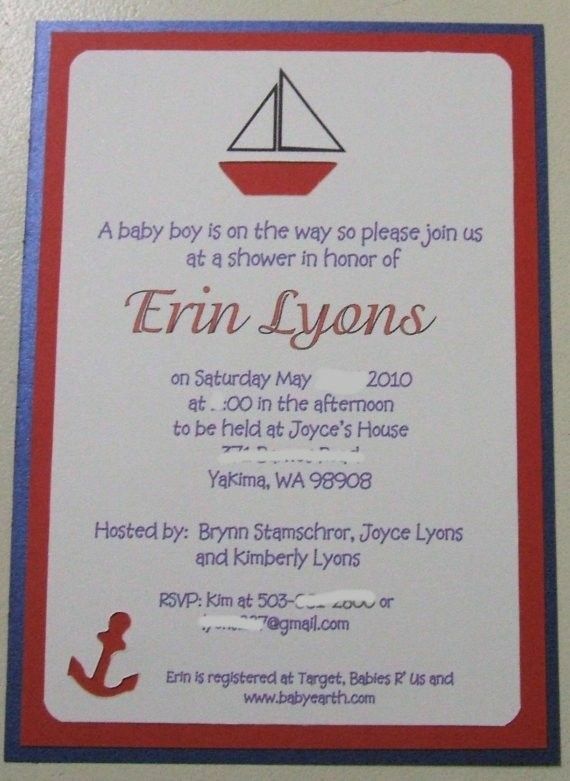 This listing is for 40 custom nautical themed baby shower invites. These are special invites double matted printed on metallic white cardstock with a sail boat diecut from the invite so the first matting layer color peeks through, also in the bottom corner an anchor is diecut. These invites are handcrafted, and can be done in any color scheme and with any diecut pattern to fit your theme. After purchasing listing I will ask you to provide the pertinent party info and a digital proof will be provided wtihin 24 hours, upon final approval of proof we will print and assemble. Envelopes are included with invitations. Unlimited revisions are provided so I will work until you feel they look perfect. Please convo me if you are looking for invites for your event, each item is custom designed so I can do one special for your event .